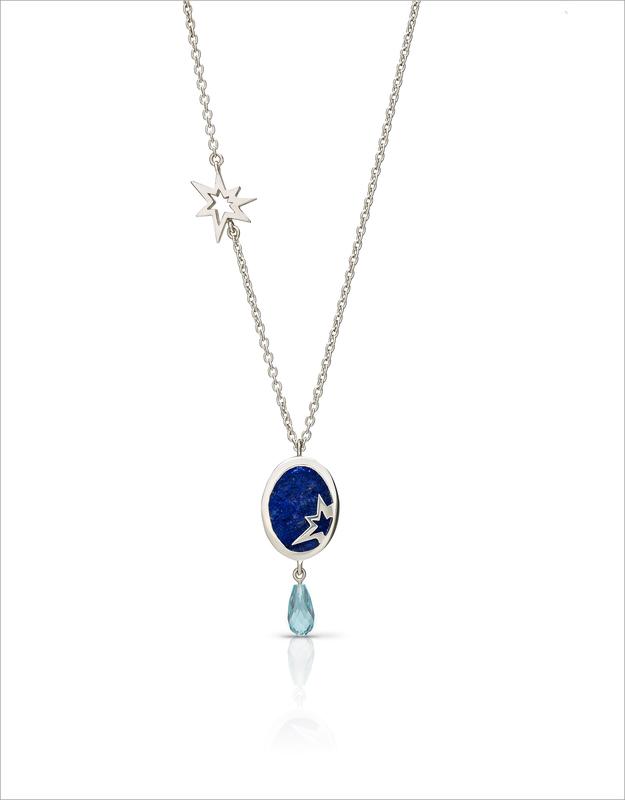 Silver, aquamarine and lapis lazuli- name a better trio to put into a piece of jewellery. The varying blues of the lapis lazuli and aquamarine almost gives off the illusion of the light blue sky descending into the dark night sky, changing from a baby blue to a deep, navy. It is a unique and contemporary necklace, beautiful both front and back, perfect for those times when your necklace flips when you wear it. Silver, aquamarine and lapis lazuli. You can choose the colour of the stones, blue lapis, green agate or golden tiger's eye. Please send us a message hello@curated-crowd.com, and we will get in touch as soon as possible. Combining jewellery design with the language of pop art and the natural explosion of a firework, LeSter offers delicate, elegant designs that are made for subtle day-to-day wear, but also pieces that will turn heads with their pops of colour. With her experience as a sculptural installation artist, creating large scale pieces for private collections, such as The Riflemaker Gallery in London and Nyehouse in New York, Aishleen Lester founded LeSter with a hope of creating bespoke jewellery that holds a personal message that becomes part of your everyday life. It is a positive reminder of self expression, and the importance of embracing creativity. LeSter is a jewellery brand that celebrates individuality, developing unique and timeless pieces. Other than being able to choose amongst these beautifully crafted jewellery, you are also able to customise it. Their bespoke work is created in partnership with you to ensure that you are provided with a 'physical manifestation of your personal memory or just an ode to your individuality’.